A few blog posts ago I wrote of controversial advertising and it's differences, or similarities with creatively cunning pieces of work. They're put out to be shocking, controversial, boundary pushing and generate interest and attention. There is a definite difference between creatively cunning work, and out right controversial, attention grabbing, shocking work. However, it seems that there is an even more sensitive and far stretching boundary which has now come into contention. The notion that someone, somewhere will always push that boundary and step over that imaginary line has never been more evident and shocking than a piece of work recently produced by DDB Brazil, for The WWF. 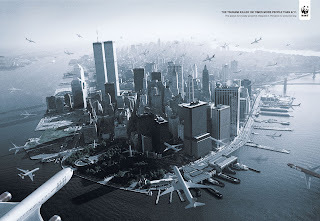 The TV and print ad show a large number of planes heading down into lower Manhattan, in which the two tragedies of 9/11 and the Asian tsunami are compared in terms of their devastation. A truly distasteful piece of work, which should never have even passed as a creative idea, let alone approved for publication. The ad industry is built upon creativity and flair, whether that be cunning or controversial. However, it should never be disrespecting or contemptuous on such a large and far reaching scale, or on issues of such tragedy, particularly in this context. The WWF have condemned the pieces of work released and stated that they did not authorize the ad's production or publication. Suggestions were made in regards to it's authenticity, whether it's a fake or not, there is a TV version to go with it, and DDB Brazil claim the ad did run just once. (Update) The WWF and DDB Brazil have both accepted responsibility for both pieces of work, and have apologized for their actions.